Helping amateur players reach their goal of playing professional baseball is the number one focus of the major league draft. While the process is exciting for players and their families, the results can be surprising, with some players getting selected by organizations that had little to no interaction throughout the process. Such was the case for right-handed pitcher Conor Fisk. 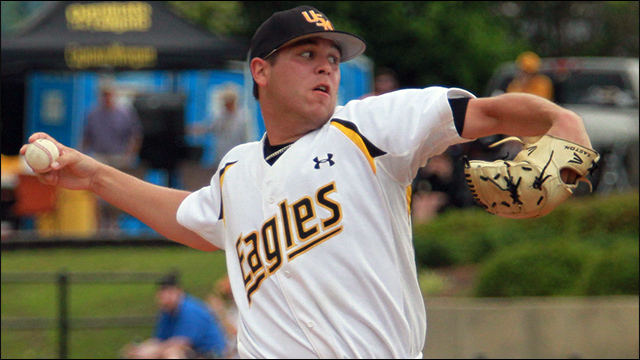 Receiving consistent contact from numerous organizations throughout his senior season at Southern Mississippi, Fisk knew he would be selected somewhere. But he never would’ve guessed he’d be putting on a Toronto Blue Jays hat on draft day. Surprised and humbled by his 24th round selection, Fisk was excited to begin his lifelong dream of playing professional baseball. While the news of joining the Blue Jays was shocking, Fisk is more than willing to put the work in to prove the organization made the right choice. The selection looked like a solid one, as Fisk had an excellent first professional season with the Blue Jays advanced-rookie ball club in West Virginia. Appearing in 33 2/3 innings, the righty registered 36 strikeouts, maintaining an excellent 9.6 K/9 ratio. As impressive as his K/9 ratio was in Bluefield, Fisk’s best stat was his 1.158 WHIP. The prospect achieved this while transitioning to relieving. Performing as a starter at every other level of baseball, Fisk admits this adjustment took him a little time to figure out. Preparing for professional baseball at the collegiate level, Fisk split his time between Wabash Valley College and the University of Southern Mississippi. Thankful for both opportunities; the young pitcher feels each program excelled in certain areas that made the transition easier. Continually finding success on the mound comes from Fisk’s approach. Throwing from a 3/4 arm slot, the righty features four pitches: a fastball, curveball, slider, and changeup. Using four different pitches helps Fisk keep hitters off-balanced. But more importantly, it’s the speed and action he uses when winding up that keeps hitters guessing. Making a lot of memories in college baseball doesn’t compare to the emotions he felt in his final season of high school baseball. After the loss of a teammate and friend, Fisk’s Grafton High School squad rallied together and reached the state finals. The Wisconsin native also had another memorable moment after his senior season when he was selected by his hometown team, the Milwaukee Brewers in the 34th round of the 2010 MLB draft. Honored by the selection, Fisk had to make a tough decision between signing, or pursuing college. Putting the finishing touches on his off-season routine, Fisk feels he’ll be well-prepared for the challenges of his first spring training. Not knowing what to expect, the 22-year old is hoping to make a solid impact this season in hopes of earning a promotion to a full season affiliate. Be sure to follow Conor Fisk as he looks to make the jump to a full season affiliate in 2015.